Our strategy is very simple: We know that the love and connection we have established with each dog brings out its best quality as we step into the ring. The rest is easy. We love to show your dog; it is our passion! This is why we are dedicated to making your dog’s show experience the very best it can be from beginning to end with our knowledge and customer service. We are knowledgeable about each dog’s individual needs with regard to training, nutrition, grooming, and conditioning. Our facility and show vehicle are very clean and specifically designed to provide comfort and security to any breed of dog: Size, coat, and temperament are paramount in not having a one size fits all set-up whether at home or on the road. We believe communication with the owner is paramount. When your dog is with us, we are accessible via phone, text, or email to communicate any show news or to just reassure you that your dog is safe and happy. We are just a couple that get our life together, because and for the dogs. We are the dogs connection. Marlene was born and raised in beautiful Panama City and animals were always a big part of her life as well. Her love of the pure breed dog started at a young age. Marlene’s first show dog and breed dog was the Welsh Corgi Pembroke; she mix British and American lines having the opportunity to show and finish them in many countries including Peru, Ecuador, Colombia, Panama, Cuba and Mexico. Her kennel Darleen (FCI recognized) is home of over 21 champions. Later Marlene imported Shih Tzu breeding stock from the USA and started a very successful breeding program. Her breeding program produced show quality dogs to several countries where they became champions and won BIS awards. This breed also gave Marlene the opportunity showcase her grooming talent, an activity that she enjoys to this day. In addition to showing dogs and having a dog breeding program early in life, Marlene also educated herself by taking the time attend Law School and become an attorney. However, the passion of working with dogs, both through grooming and in the show ring, truly became what she wanted to do. And, it was dog showing that truly changed her life, because this is where she crossed paths with her future husband! At the Costa Rica Dog Show in 2002, Marlene was handling Andy the Shih Tzu in the Toy Group, Memo was showing Dana the Smooth Coat Chihuahua in the Toy Group, and that’s where they met. In 2003 Marlene moved to Mexico, married Memo, and their canine passions, and professional ambitions, became one. In addition to professionally handling, grooming, and breeding dogs, Marlene and Memo have a wonderful son, named Dominic, who travels to shows with them when his school schedule allows. Memo was raised in a home where animals and their welfare were important to his family. Memo became a member of his local Kennel Club (KC) and went to his first dog show as a steward. Soon he showed his own black Labrador retriever and the rest is history – he was completely hooked! After showing in his youth for a few years, Memo moved to Mexico City where he earned his Doctor of Veterinary Medicine with a degree from UNAM. His thesis was entitled: “Care and Grooming of a Dog’s Harsh Coat” which provided elaborate detail on skin diseases, as well as the grooming protocol, on 56 different breeds. He assisted in many seminars set up by the Mexican KC, while at the same time showing dogs and getting his first Best in Show (BIS) in December of 1994. In 1995 Memo resided in the U.S., working under the guidance of the renowned handler Clay Coady, from whom he learned more about show grooming and the conditioning of many breeds. 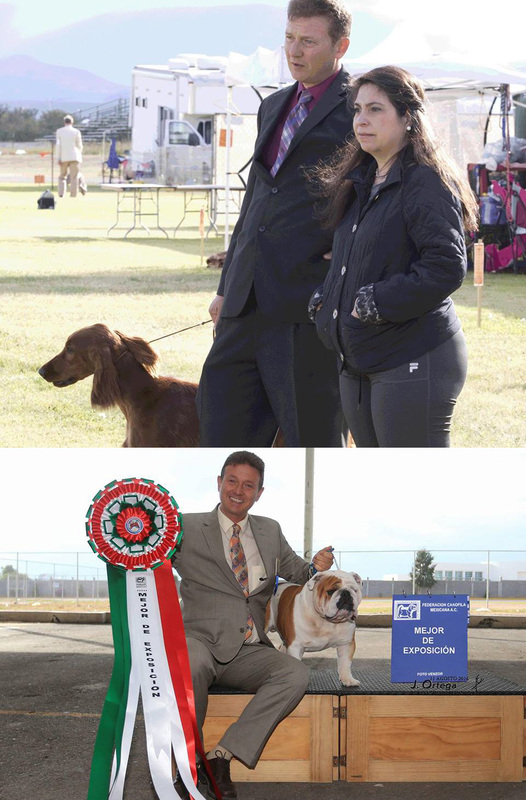 Back in Mexico, Memo’s handling career gave him the opportunity to work with awesome clients, show many breeds, and earn several BIS awards. In 1997, the Mastiff he was showing finished as the top winning all-breed with a total of 27 BIS awards; the Mexican Kennel Club recognized Memo as the Handler of the Year! At a dog show in Costa Rica, Memo meet a beautiful and talented breeder/handler by the name of Marlene Mastellari who later became his wife. In 2003, Memo and Marlene set up a Vet Clinic in Mexico in conjunction with a grooming facility. In 2005 they decided to sell the business and start a new adventure in their respective fields in a new location – the United States of America. They bought their home in Mesa, Arizona and began to build their business from the ground up to the expansive business it is today.